New Delhi: More people could have lost their lives in June, in a replay of the events that led to India’s worst air crash in a decade in Mangalore last year that killed 158 people. 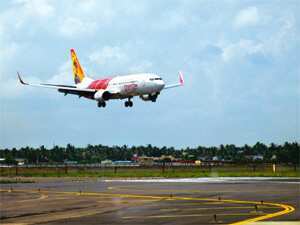 On 25 June, an Air India Express flight (IX-208) from Mumbai landed deep into the table-top runway located on a mountain in Mangalore. The captain decided to take off and land again after circling the airport, but the co-pilot overruled him in the nick of time and applied the brakes, bringing the aircraft to a stop at the edge of the runway. A 300-ft gorge stared below. The Directorate General of Civil Aviation (DGCA) is investigating the incident, said two government officials familiar with the matter, declining to be identified. Air India Express, the low-fare arm of Air India Ltd, continues to run without a qualified chief of flight safety even a year and four months after the ill-fated crash in Mangalore. Incidents such as the ones described earlier are increasing. One of the government officials mentioned above said the landing of the IX-208 flight was of a magnitude of 2.9 G (acceleration due to gravity). The maximum allowed for a Boeing 737 aircraft, like the one Air India Express was flying, is 2.1 G.
A 2.9 G magnitude means landing an aircraft weighing 70 tonnes would be like landing an aircraft of 200 tonnes. The impact could have broken the belly of the aircraft. An Iberia A 340-600 made a similarly hard landing of 3 G magnitude in 2007 in Quito, Ecuador. Its landing gear sensors got damaged, and that prevented normal deceleration of the aircraft due to the failure of thrust reversers and spoilers. The aircraft was damaged beyond repair. The Air India Express IX-208 was operated by commander Saravjit Singh Hothi, 62, and co-pilot Manish Chimurkar, 34. Air India Express chief operating officer S. Chandrakumar confirmed the incident. “After the Mangalore crash, the standard of co-pilot training has been improved; so the co-pilot (Chimurkar) was more aggressive in taking over control of the situation," he said. “Hothi has been grounded." In the Air India Express flight that crashed in May 2010, the co-pilot could not overrule the commander’s decision to land. The co-pilot had wanted to go around and land again, according to investigation reports. The flight overshot the runway and crashed. Ranganathan said Air India Express has not learnt lessons from the Mangalore crash and the latest incident shows poor training standards. The incident was not the only one in recent months. On 28 August, another Air India Express flight that took off from Kochi suffered a tail strike because its commander R. Sobti chose a speed suitable for an aircraft 20,000 kg lighter than the one he was flying. In a tail strike, the rear end of the aircraft hits the ground druing take-off. “Instead of take-off weight he used zero-fuel weight to calculate take-off speed," said the first government official mentioned earlier. “Worryingly, the investigation shows that the ex-Indian Air Force pilot had a tendency to have a tail strike. Why did Air India Express ignore this?" Sobti, too, has been grounded, Chandrakumar said. Till an audit is done, DGCA should ground Air India Express and let Air India run those flights, said Ranganathan and the second government official. Air India is certified by International Air Transport Association’s IATA Operational Safety Audit (IOSA), the global benchmark for airline safety; but Air India Express, despite committing to go through an IOSA audit last year after the Mangalore crash, hasn’t done so. The aviation regulator has, meanwhile, started a base inspection of the airline. “The situation is so bad at the airline that you can’t imagine," said the second government official.